Be the first to share your favorite memory, photo or story of LuVerne. This memorial page is dedicated for family, friends and future generations to celebrate the life of their loved one. LuVerne E. (Engelbrecht) Buchele, 98, died March 12, 2019 in Honolulu, Hawaii. A WW II veteran, she will be privately interred beside her husband, Robert B. Buchele, at National Memorial Cemetery of the Pacific, (Punchbowl). Nuuanu Memorial Park and Mortuary is assisting with arrangements. LuVerne Ethel Engelbrecht was born Sept. 21, 1920 to Bernhard H.P.and Frieda C.M. (Seggebruch) Engelbrecht in the family farmhouse near Onarga, Iroquois County, Illinois, the second of four children. She first attended a one-room country school and graduated from Watseka Community High School, Il in 1938. LuVerne was awarded a 4-year college scholarship by the Illinois General Assembly. She was inducted into the Alpha Lambda Delta National Honor Society; earned her BS degree with high honors at the University of Illinois at Urbana-Champaign (1942). 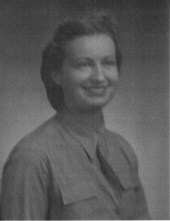 LuVerne later earned her Master’s degree at the University of Chicago (AM 1947). She taught at various public schools in Illinois, Indiana, and California. Ordered to maintain secrecy for 50 years after war’s end, LuVerne revealed the nature of her war-time military duties only in 1995. She was a Cryptanalysis Technician, one of the famed “Code Girls” who deciphered encrypted communications among German and Japanese enemy forces, work crucial to Allied victory in 1945. After the war, LuVerne met Navy veteran and PhD candidate Bob Buchele at the University of Chicago. They married Oct. 6, 1950 and had three children: Brad, Bette, and Jill. The Bucheles lived in Los Angeles, CA while Bob taught at UCLA, moving to Hawaii in 1963 when Bob joined the University of Hawaii-Manoa faculty. LuVerne retired from teaching (1955) to become a full-time homemaker. As a faculty wife and mother, she put her exceptional cooking, sewing, and gardening talents to good use. She was an avid reader. She also worked many years as a volunteer for the Girl Scouts and her children’s schools, and as an activist against cruelty to animals at rodeos, especially the inhumane, painful “bucking strap” used to provoke otherwise tame horses and livestock. Mrs. Buchele is survived by daughter Bette K. Buchele, grandson Keith A. (Janice Okimoto) Boychuk, and son-in-law Dr. Rodney Boychuk, all of Honolulu, HI; sister Jeanette C. (Dr. Walter) Whisler of Wilmette, IL; and many nieces and nephews on the mainland. She was preceded in death by son Brad L. Buchele, daughter Jill R. Buchele-Boychuk, husband Dr. Robert B. Buchele, sister Margie C.T. (Engelbrecht) Benoit, and brother Kenneth W. Engelbrecht. Memorials may be directed to Médecins Sans Frontières/Doctors Without Borders www.doctorswithoutborders.org, or Immanuel Lutheran Church, 996 N. State Route 49, Cissna Park, IL. To send flowers or a remembrance gift to the family of LuVerne Ethel Buchele, please visit our Tribute Store. "Email Address" would like to share the life celebration of LuVerne Ethel Buchele. Click on the "link" to go to share a favorite memory or leave a condolence message for the family.